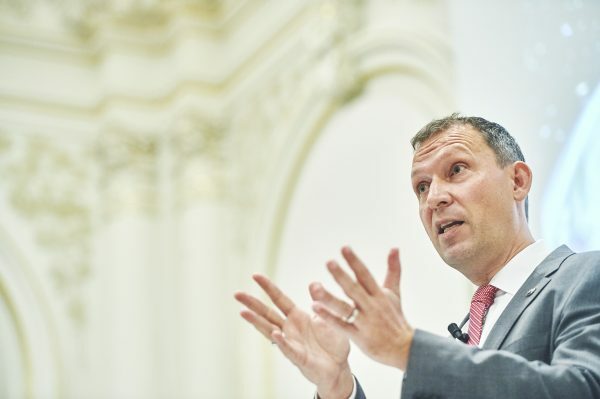 As science director of NASA, Thomas Zurbuchen is one of the world’s most influential scientists. 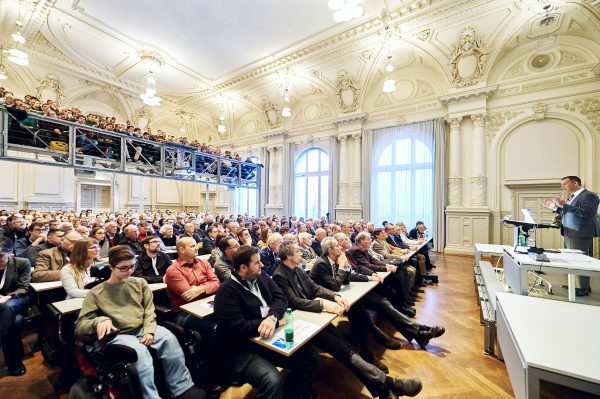 In January 2017, he visited the University of Bern, where he studied and gained his PhD in physics. He talked about his work in a public lecture. “It’s great to come across an instrument that we have talked about for many years,” says Thomas Zurbuchen, as he stands in front of the test plant in the MEFISTO laboratory at the University of Bern. A US instrument is currently calibrated in the measuring chamber. The physicist himself was involved in its development. Someday, this instrument will investigate the heavy, charged particles in the solar wind on-board a European satellite, the Solar Orbiter of the ESA. Zurbuchen explains how the laboratory at the University of Bern is the best in the world in this calibration field, because experts ensure continual, thorough maintenance of the infrastructure. “These are engineers who know what’s going on,” says the head of the NASA science mission directorate. Zurbuchen studied and worked in the Exact Sciences Building over the course of ten years. He greets his former professors and colleagues warmly in the break room, which still looks the same as it ever did. “Only the coffee machine is new,” observes the prominent guest, who reports about NASA’s recent balloon experiment in Antarctica, and also reveals that he keeps fit in Washington despite his heavy workload and many meetings, with the help of regular training sessions in the weights room and jogging. “I have the body of a farmer and have to exercise,” says the research manager, who is in charge of an annual budget of five billion Dollars and distributes research funds to 10,000 scientists. Raised in Heiligenschwendi in the Bernese Oberland, Zurbuchen was the first in his family to tackle a degree. 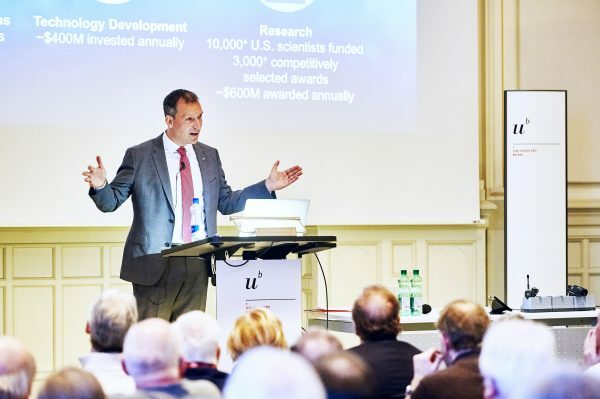 The highest NASA scientist credits Switzerland’s successful school system with the fact that a child from a mountain village interested in science was able to gain a PhD in physics and carve out such a good career. “Switzerland should be proud of it,” he says, “And the University of Bern gave me a lot too.” He praises the educational lectures, but also appreciated that he was sent elsewhere to summer schools and had a budget of 50,000 Swiss francs for measuring instruments even back as a degree candidate. As well as solar research, and the science of earth and planets, astrophysics is also part of Zurbuchen’s repertoire. In 2018, NASA wants to take a new space telescope with a mirror diameter of 6.5 metres into space. Zurbuchen explains how the James Webb telescope is the largest and most important telescope that NASA has ever had. The new instrument is expected to be so good that you could see a bee on the moon. “But – to be honest – we are not yet one-hundred percent sure whether it really works,” admits the NASA chief scientist. An incredibly risky matter, but now and again you have to be a little nervous. Otherwise, you’d spend 20 years in the same place without making any scientific advancement. Protecting and improving life on earth, search for life elsewhere and expanding our knowledge: These are the key scientific themes of the American space agency. This is why 88 NASA satellites are currently flying through space. They are used, for example, for weather forecasting, help to bring forest fires under control, are meant to predict tornados and hurricanes, but also find distant exotic or earth-like planets and provide confirmation of Einstein’s general theory of relativity. On Mars, two rovers are currently collecting data. A NASA probe is orbiting Jupiter, another is on the way to asteroids and is expected to bring material from these back to earth.